Next week I will be taking off for the Disneyland Half Marathon weekend and I am so excited, I can hardly stand it. As of today, I am almost entirely packed! I'm a planner by nature, but a runDisney event (or any travel race) is not your neighborhood 5k and requires a little more preparation. Here are some of the tips and tricks I've acquired over the years. A not-so-hidden Mickey in this picture! I start with some of the essentials - my shoes, my Garmin, and my iPod. I also make sure to have my chargers because there are few things more disappointing/terrifying than getting up for a race and your technology not being charged (I had this experience last weekend during my long run). I do have my toiletry bag completely packed at all times because I have to travel quite a bit for work. If you've ever had to reassemble all of your toiletries while traveling, you understand why this is one of the first things to make my suitcase. Next I lay out my race outfits! Because I'm running the Dumbo Double Dare, I need two. Right now, it looks like the weather in Anaheim is going to be in the low 60s, so that means dressing for warm weather. 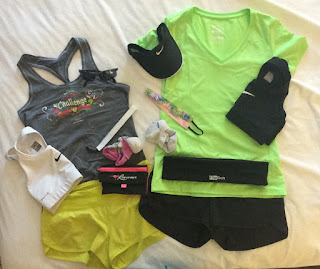 I also pack a few options, the requisite Sweaty Bands (coordinated with my outfits), a visor, sunglasses, and a way to carry my music, phone, and room key (I like both the RooSport and FlipBelt). Of course you can't forget your clothes for visiting the expo and parks either! One of the things I love about runDisney events is the sense of community throughout the whole weekend. After the races, runners often wear their shirts and medals to the parks. For packing, that means you can save some space and plan to wear your race shirts during your trip! I do bring one or two shirts though, especially some of my favorite Disney-themed tops from RawThreads. I'm also partial to running skirts for the parks. Not only are they cute, they dry really fast if you get soaked on water rides. A great bag/purse to carry your treasures! I got my Harvey's Pirates of the Caribbean bag at Disneyland (special for the 60th anniversary). My buffer/massager (yep, it's a car buffer turned running tool). A light jacket - mornings and evenings can be on the cooler side. A throw-away poncho, just in case. It unexpectedly poured just before this year's Tinkerbell 10k. An old mylar blanket can also serve the same purpose. Flip Flops for down time. This seems to be an exciting time for Beauty and the Beast, so I'm bringing my Belle Havaianas. They also have Cinderella and Snow White (yes, I have these, too). Want your own? Check out their website or visit them at their Disneyland Half Marathon expo booth! Airborne - one sick person on a plane can lead to a plane full of sick people. I give my immune system all the help I can give it by keeping up regular doses of vitamins. Sunscreen - I don't mess around when it comes to sun exposure. Snacks - no one wants to see this princess get "hangry." Plastic bags - the hotel I stay at has complimentary breakfast so I snag an extra bagel and peanut butter, tuck it away in my plastic bag for freshness, and am all set for race morning. So there you have it! I'm almost ready and cannot wait! What are your must-haves for a travel race? Have you ever forgotten something really important? I think you've got it covered! Have the best time and enjoy the entire experience! Cannot wait to hear all about it. That is a really great point! I've seen a few different checklists from running organizations, but haven't really used them because they aren't specific to me. I should make my own ... maybe laminate it. The planner inside me is getting excited :) Thanks so much for the fantastic idea and I don't know how you triathletes do it! Way too much gear to keep track of! I like running w my roo sport too.I a so have a flip belt but I got it too big so I never wear it bc it always slides up. Looks like you are all set to go! That would really annoy me if my Flip Belt did that! I love my Roo Sport, but find that if I run more than about a 10k with it, it rubs and I get awkward chafing (not very Princess-like).